Mouse anti Human Corticotrophin Releasing Factor antibody, clone 4H9 recognizes human corticotrophin releasing factor (CRF), a hormone found mainly in the hypothalamus that regulates the release of corticotrophin from the pituitary gland. The unique lysine residue (Lys-36) is likely to be involved in the antigenic determinant as lysine modification by CA blocks binding completely.  Human serum, containing CRF-binding protein, also inhibits the binding of this antibody to CRF. Corticotrophin Releasing Factor conjugated to Bovine Serum Albumin. Averages 10(e)-9 M with native and modified CRF. 1This product requires antigen retrieval using heat treatment prior to staining of paraffin sections. Sodium citrate buffer pH 6.0 is recommended for this purpose. Enzyme digestion with 0.1% trypsin may also be necessary. Kravchenko, I. V. & Furalev, V. A. (1994) Monoclonal antibodies directed against two different corticotropin-releasing factor determinants. DeBellis, A. et al. (2012) Involvement of hypothalamus autoimmunity in patients with autoimmune hypopituitarism: role of antibodies to hypothalamic cells. J Clin Endocrinol Metab. 97 (10): 3684-90.